Padma Shri Haldhar Nag inaugurated the Mati Maa Unnati Mela at Sirabahal, 20 km from here, on Friday. Jointly organised by the Krushak Samiti Samuha and the Bhim Pahad Krushak Producers Company, the fair was thronged by villagers. 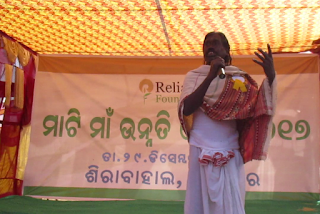 Haldhar Nag narrated his struggling life and his experience of receiving Padm Shri. “I have always strived for development of the motherland, the mother tongue, Sambalpuri Kosali,” he said and stressed on cultivation of traditional paddy seeds and use of organic fertiliser to get more production and to shun cultivation of hybrid and high-yielding varieties. Deogaon Block Development Officer Shankar Prasad Sahu emphasised on new initiatives to increase income from the same plot of land. Balangir Krishi Bigyan Kendra Senior Scientist Ashis Das and District Agriculture Officer PK Rath spoke on judicious use of land water for better production. Madhu Sudan Sethi of the RWSS stressed the need of spreading the message to stop open defecation in the rural areas to lead a disease-free life. The Bhimpahad Krushak Producers Company, the Reliance Foundation and the RWSS have opened their stalls in the fair. A one-act play with the theme of doubling the income of farmers was staged. Udar panchyat sarpanch Kanhu Meher, Kuturla sarpanch Bada Pradhan and Mukundpur sarpanch Balak Pradhan were felicitated.